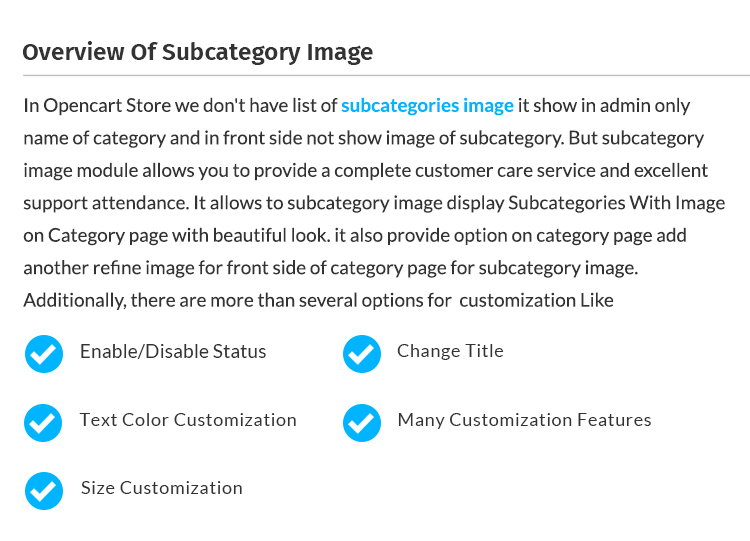 In Opencart Store we don't have list of subcategories image it show in admin only name of category and in front side not show image of subcategory. 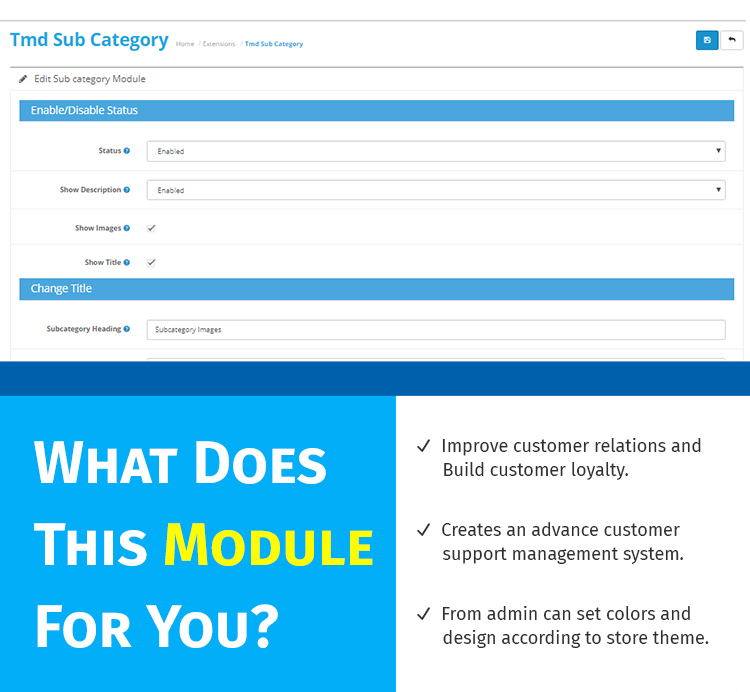 but subcategory image module allows you to provide a complete customer care service and excellent support attendance. It allows to subcategory image display Subcategories With Image on Category page with beautiful look. it also provide option on category page add another refine image for front side of category page for subcategory image. Improve customer relations and Build customer loyalty. Creates an advance customer support management system. From admin can set colors and design according to store theme. * Change Size of Image Width & Height. * Selection of Image which image you want to display in front. This Module has Ability to display subcategory image in List View Or Grid view you can set this option from admin panel as per need. 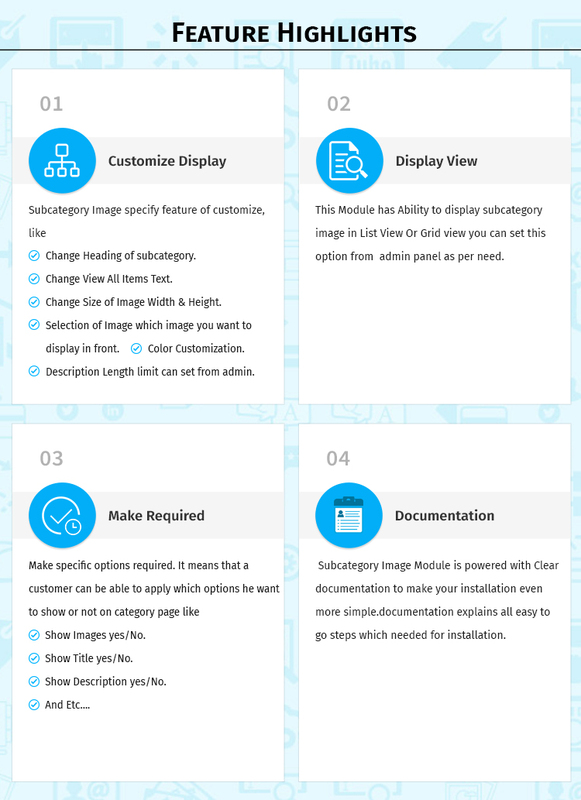 Subcategory Image Module is powered with Clear documentation to make your installation even more simple.documentation explains all easy to go steps which needed for installation. 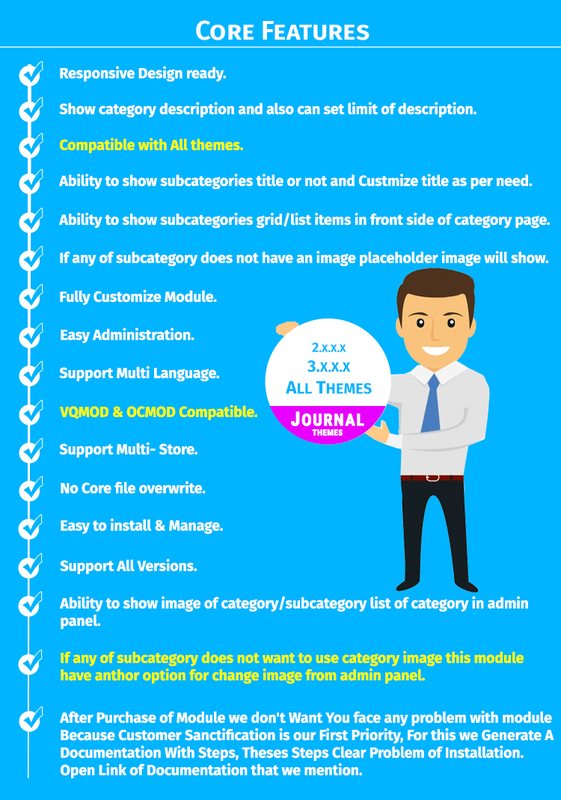 - Ability to show image of category/subcategory list of category in admin panel. - Ability to show subcategories grid/list items in front side of category page. - If any of subcategory does not have an image placeholder image will show. - If any of subcategory does not want to use category image this module have anther option for change image from admin panel. - show category description and also can set limit of description. - After Purchase of Module we don't Want You face any problem with module Because Customer Sanctification is our First Priority, For this we Generate A Documentation With Steps, Theses Steps Clear Problem of Installation. Open Link of Documentation that we mention. 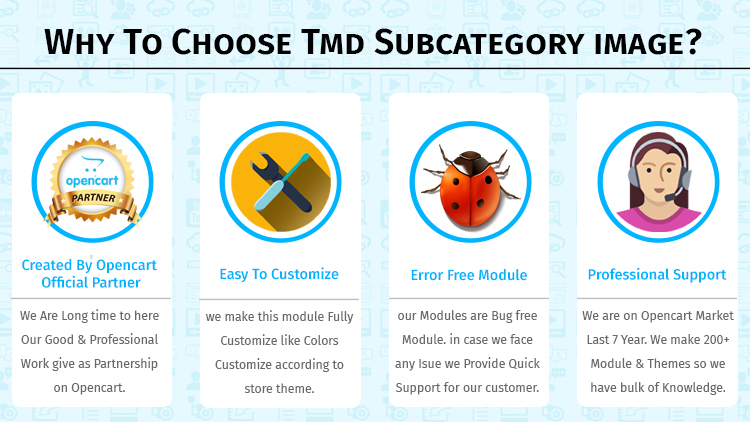 we make this module Fully Customize like Colors Customize according to store theme, change title of heading and button. our Modules are Bug free Module. 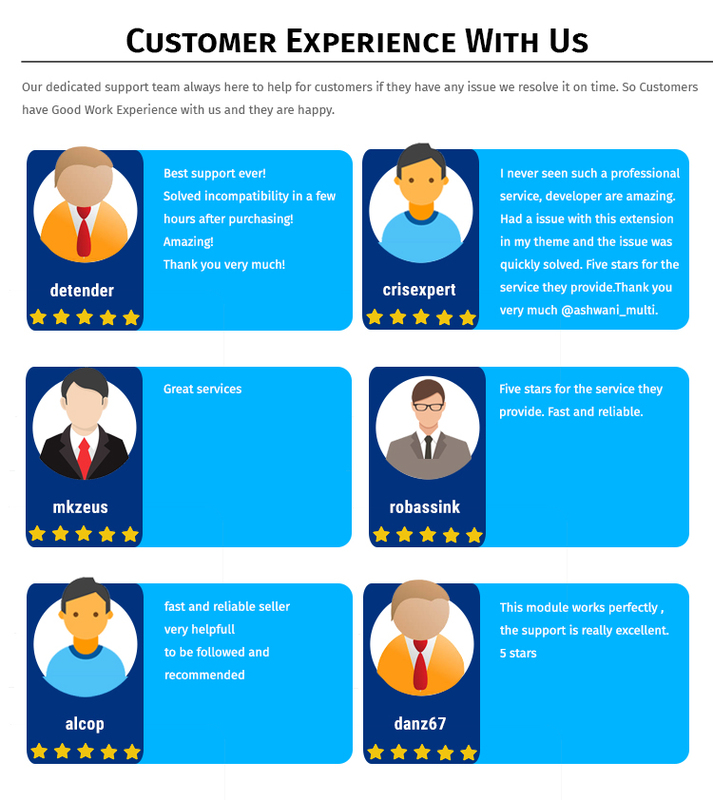 in case you face any Issue we Provide Quick Support for our customer. so all customers are happy with us. We are on Opencart Market Last 7 Year in this Markit we make 200+ Module and Themes so we have bulk of Knowledge in this framework. So or customer Face Any Issue During Installation Process we Provide Absolutely Free of Cost Support. This Process is 3 Month after your purchase, you can enjoy technical and feature support. For 30 days after your purchase, you can enjoy technical and feature support and this Support is if You face any issue During Installation or any Custom theme. Tags: 2.0, category image, sub cat images, sub cat image, cat images, cat image, refine search images, refine search image, refine images, refine image, child category images, multiple category images, multiple category image, different sub category image, different sub category images, diff sub cat image, diff sub cat images, child category image, child cat images, child cat image, images under refine search, images under refine, subcategory images, subcategory image, subcat images, subcat image, multi cat images, multi cat image, multi category images, multi category image, sub category images, sub category image, category images.